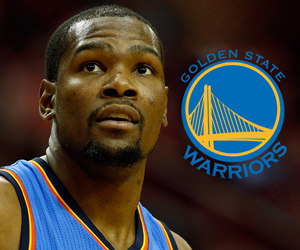 Fourth of July fireworks weren’t solely reserved for the night sky Monday, as NBA news wires lit up and exploded with the announcement that Kevin Durant was leaving the Oklahoma City Thunder to sign with the two-time Western Conference champion Golden State Warriors. Durant made his decision public just before noon ET, and that left oddsmakers scrambling to adjust their NBA title odds and futures. At renowned online sportsbook, Sportsbettingonline.ag , Golden State jumped from +200 to -200, making the Warriors the front runners to win the NBA title in 2016-17. “It’s still kind of a shocker, even though we knew it was a possibility,” Dave Johnson, head oddsmaker for Sportsbettingonline.ag, says of Durant joining the Warriors. Sportsbettingonline.ag was one of the few sportsbooks in the industry that had Golden State behind the Cleveland Cavaliers on the NBA Championship futures board, with the defending champion Cavs opening at +175 following their upset win over the Warriors in the NBA Finals. Johnson expects Golden State to not only avenge its loss in the finals, winning its second title in three seasons, but he’s also projecting the Warriors to challenge their own regular season wins record of 73 victories. He’s set Golden State’s 2016-17 early season win total at 73.5, making basketball bettors take a side: will the Warriors be better than last year or not? The bet on Yes, they will win more than 73.5 games is -130 and the bet on No, they will not win more than 73.5 is +110. Sportsbettingonline.ag is taking those odds one step further, and will offer wagering on whether or not Durant, Stephen Curry, Draymond Green, Klay Thompson and the rest of the Golden State squad will go undefeated in 2016-17. The Warriors started the 2015-16 campaign on a 24-game winning streak, which was finally snapped on December 12, and finished the regular season at 73-9. The odds on Yes, they will go undefeated is +5000 (bet $100 to win $5000). Check out Sportsbettingonline.ag for all the latest NBA futures and summer league betting odds.